BA (Hons), LLB (Hons) Syd, GDLP. 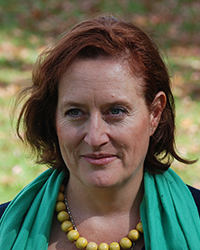 Mary Spiers Williams is a lecturer at the ANU College of Law. She has broad range of experience in criminal law and criminology research, teaching, practice, policy and advocacy. Her research is on impacts of state law on Indigenous peoples and the phenomenon of transnational law. Her doctoral research is concerned with legal concepts of culture in sentencing law in the Northern Territory. Mary Spiers Williams, a former legal practitioner in criminal law and lecturer at ANU College of Law writes in Woroni about over-incarceration rates. The Centre for International and Public Law is proud to host a panel discussion during National Reconciliation Week. Each panel member will speak on an aspect of their research that affects Indigenous communities. Mary’s research focus is social justice and criminal law, particularly on the impacts of state law and legal processes on vulnerable peoples. Her research is influenced by sociolegal scholarship, Australian Aboriginal laws and Indigenous perspectives on state and transnational legal orders. Mary’s current major project is doctoral research examining a legal concept of culture in of sentencing law and practice. This research is a multi-streamed analysis that draws upon theoretical perspectives of social field theory, colonisation, legal pluralism and legal orientalism. She uses this to analyse ethnographic fieldwork conducted in central Australian courts and communities. Here she observed and recorded otherwise unreported summary court cases, the jurisdiction which disposes of the vast majority of sentencing matters. In order to explore the concept of culture used in sentencing law, her thesis engages in a broader examination of the epistemology of sentencing law, examining gaps and opportunities to render it more coherent, and reimagines sentencing law in light of sociolegal perspectives. Mary’s research interests are inspired by her experience as a solicitor and barrister, criminology researcher, policy maker and advocate, and ongoing collaborations in those fields. Her research inspires her teaching, which includes teaching courses that situate the criminal law in context and encourage examining law from global and local perspectives. Doctoral research: "A legal concept of culture in sentencing law: case studies from central Australia." Spaces of Indigenous Justice: an international research collaboration hosted by the University of Arizona. 'Can thinking about 'culture' ameliorate poor justice outcomes in sentencing? ', Law and Society Association of Australia and New Zealand, University of Otago, Dunedin, New Zealand, 8 December 2017. 'The Findings of the NT Royal Commission into Child Detention: Overview and Implications', panel discussion with students from the ANU Law School's Youth Justice Research Group, 27 November 2017, Australian National University, Canberra. ‘Taking responsibility for the way we think about state law: recognising the negative impacts of state laws, legal systems, legal training and legal scholarship on Indigenous peoples’, National Reconciliation Week Panel, Centre for International and Public Law, ANU Law School, 1 June 2017. Facilitator of Panel Discussion for the Law Students Society, ‘LSS Presents: Indigenous Australians & The Law’ panel of The Hon Labor MP Linda Burney, Ms Jacinta Nampijinpa Price, Alice Springs town councillor, and Associate Professor Asmi Wood responding to student questions on legal issues affecting Indigenous peoples, 3 May 2017. ‘Responding to Don Dale: Coming to terms with our irresponsibility as legal practitioners for young people’s experience in detention centres’, Annual Australian and New Zealand Society of Criminology, University of Tasmania, Hobart, 1 December 2016. Facilitator, 'Imagining alternative justice futures for Indigenous children in the ACT,' A Change the Record – Community is Everything Community Forum Hosted by ANTaR ACT and Amnesty ANU, supported by the ANU College of Law Reconciliation Action Plan Committee, ANU College of Law, Australian National University, 30 May 2016. ‘The ongoing relevance of the Royal Commission into Aboriginal Deaths in Custody’, Amnesty ANU & SUNSW/ACT Amnesty, screening of Who Killed Malcolm Smith? to mark the anniversary of the RCIADIC, ANU College of Law, Canberra, 18 April 2016. 'Mass incarceration of Aboriginal people in Australia: can law be emancipatory?, Inside Out, (Annual Law and Society Association of Australia and New Zealand), Flinders University, Adelaide, 1-3 December 2015. ‘Concepts of public and private in the criminal law: their role in legitimising criminalisation and suppressing subaltern perspectives on place’ (2014), Public Places, Private Lives Conference (Annual Law and Society Association of Australia and New Zealand), University of Queensland, 3-5 December 2014. 'Making justice more meaningful in one Aboriginal community: Possibilities emerging from sharing law ceremonies to enhance mutual respect' (with Wanta Jambajimba Patrick) (2012) 11th Symposium on Indigenous Music and Dance, 1 December 2012, Canberra. 'Makings sense of "Riot": the fragile legitimacy of police powers and public order offences in an Intervention.' (2012) 6th Annual Australian and New Zealand Critical Criminology Conference Program Hobart. ‘Opportunities Postmodernism offers for Tasmanian Land Rights’ (1996), presented at Australian and New Zealand Society of Criminology Annual Conference, Victoria University of Wellington, Wellington, New Zealand, February 1996. ‘Response to request for submissions to assist the Commission to plan its future work,’ Submission to the Royal Commission into the Protection and Detention of Children in the Northern Territory, 26 October 2016. - ANU Ally Network for LGBTIQ+ inclusion, supporting a diverse and inclusive ANU. Many students now seem to be under considerable pressure. How students respond to this pressure can have a significant impact on their learning experience. In order to make the most of learning opportunities, students need to be as relaxed, happy and grounded as possible and I try to create a space for this to happen in the class room. Having said this, I demand a lot of students and will not simply deliver content. Rather, I give students the chance to test their knowledge and to feel free to make mistakes in this experimental space. While it is important to provide students with a framework for problem solving and knowledge acquisition that can carry them through a course, my role as a teacher is to create a space for students to develop autonomy and work collaboratively. I endeavour to engage with all students as much as possible given the constraints. In order for students to understand law it is necessary to develop knowledge and skills in legal doctrine and its application together with an understanding of the context of the application, in particular its broad social impact. I’ve found that students are more engaged if they understand the purpose of the law and can see themselves in that. In the courses that I teach there is wonderful opportunity to help students realise how their practice of the law can have a real and positive impact on the lives of people and in that process on society generally. University is a unique moment in our lives, and it is important to me that the class room experience is rich one. Mary’s doctoral research examines a legal concept of culture in of sentencing law and practice. This research is a multi-streamed analysis that draws upon theoretical perspectives of social field theory, colonisation, legal pluralism and legal orientalism. She uses this to analyse ethnographic fieldwork conducted in central Australian courts and communities, where she observed and recorded otherwise unreported summary court cases in the jurisdiction that disposes of the vast majority of sentencing matters. In order to explore the concept of culture used in sentencing law, her thesis engages in a broader examination of the epistemology of sentencing law, examining gaps and opportunities to render it more coherent, and reimagines sentencing law in light of sociolegal perspectives.